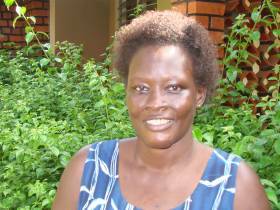 Anna Ocen (oversees UGA03a) is currently working with a group of widows and single mothers in Mbale where she lives. These women are not war victims, a number of them are HIV/ AIDS widows. Their ages range from 30 – 60ish with more in the high 40's. These women have set up a small loan programme but are needing additional funds to take their businesses to the next level. 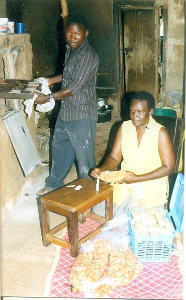 Since 2005/6 this group has been running a micro-enterprise loan programme. For the first two years, it operated well. It began by the group members bringing around U/-15,000 each to the group and then loaning this out to the members. The members then began small businesses and started trading. The money was interest free and each person in the group received different sized loans. After a period of about 18 months the group went to a local NGO called Action For Children (AFC) and got a loan of around U/- 1,500,000. They repaid the loan with 1% per month interest in four months. A second loan was taken for over U/-4,000,000+ and they brought a lot of women into the group. The group was a Christian group and they were able to develop a strong Christian witness. The second loan was repaid within the four month time frame. A third loan was taken for more than U/-5,000,000+ which was again repaid within the time period. Over this period of time the members of the AFC programme became largely full of people from another faith which made them uncomfortable. They decided to leave AFC as it was compromising their ability to do ministry with their women friends. Currently there are around 300 women in the AFC organization in Mbale. After repaying the third loan and pulling out from AFC, the group went to Centenary Bank, a commercial bank, and took out a loan for U/-4,500,000 to continue their operations. This loan was for four months and the first three repayments were made and deposited in the bank. On the date of the final repayment in October 2008 Anna received the money from the women for the last repayment; the total amount was U/-100,000 ($US650). After collecting the money she went to the bank but it was raining and the bank said it was too late for deposits so she had to take it home. That night robbers entered the house and beat her severely over a period of 5 or 6 hours. They threatened that she would die if she did not pay them and so the money was lost. She has never had money in the house like this before. The major problem now is that the group cannot borrow any more money. Anna herself had taken out a loan and fortunately had paid it back before the robbery. Bright Hope World has had a long association with Anna Ocen and she is very involved in our partnership in Lira with the Hope Restoration Centre childrens' home. It was during a visit to Lira by the BHW Field Director in September 2009 that Anna made him aware of the situation of these women and asked whether we would be able to help these ladies. The women involved in the loan programme are the direct beneficiaries here but obviously there will be a significant flow on effect as they are able to better provide for their families, send their children to school and have a positive impact in their community. 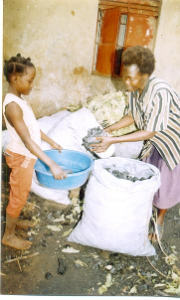 As the loan programme funds increase they will also be able to include other women in the programme. These ladies obviously have very hard lives and are seeking to provide for their families. They have shown initiative and set up a loan programme whereby they seek to help each other lift themselves out of their life of poverty. It is exciting to be able to partner with women like this and provide the little bit extra they need to take their businesses to another level. Anna Ocen is the key person for us in this partnership. Anna is married to Simon and they have a small family of their own and a few others they care for and have brought into their family. 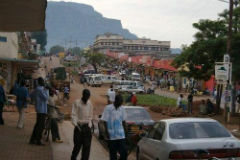 They live in Mbale but Anna travels to Lira once or twice month to visit the children there. She is an accountant so is able to provide good reports. The vision here is for these ladies to continue to grow their loan programme, establish their businesses and help other women, thereby lifting them out of their life of poverty. 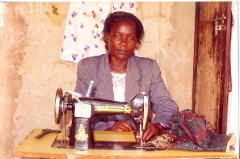 Grace Ebino is one of the widows in the Mbale programme. She is in her 50s and is a widow. She has seven children to care for. She is Anna’s good friend and a lovely Christian woman. She started a business of selling food products to people. She grew that into baking and selling her products. She got to the point of supplying her products to a local supermarket. She is currently using a local oven but hopes to buy a commercial oven. A few of her friends help her with the baking and she is teaching them to bake. She bakes pancakes, chipatis, wedding cakes, half cakes and queen cakes. She now faces a problem as the supermarket is demanding that the bakery goods should be put into proper packaging but without access to a loan this will not be possible.